Resistance lines are one of the basic tools of technical analysis. They are lines that denote areas where price action is likely to pause, stop or reverse. Why is this? It is because they are areas on a chart or price levels where the market is selling and is said to be resistant to higher prices. These are levels where the market has already decided to sell because it doesn’t think prices can go any higher, an area where the market may as well sell, an area where the market has sold before or an area where those who once were winners are now losers. Regardless of the reason, if price action halts, moves sideways or reverses it is said to have met resistance. Let me elaborate. If a market moves up to make a high and the falls back that previous high is now an area of possible resistance. This is because anyone who was a buyer at the peak is a loser when the market pulls back. Then when prices return to the previous high it becomes an opportunity for those losers to get out of the market at break even. Those sellers then become resistance to higher prices. Resistance can come in the form of news, earnings, valuations, economics or many other fundamental and technical reasons. For us as chartists and technical analysts resistance, in terms of this article, comes in the form of price action. Price action that forms resistance can be a peak or series of peaks with even height, consolidation zones, congestion bands and other areas of interesting price action. Basically, any area that looks like it could give the market pause on a move up. I typically stick to peaks in bull/bear markets and congestion/consolidation areas. We can mark these areas by drawing a horizontal line that extends out to the right of the chart. This way, anytime that price action approaches this level you will know to expect a signal. The thing to keep in mind is that just like support lines and Fibonacci Retracements resistance lines are not a signal by themselves. Price action reaching a line is not a reason to enter a position. Resistance lines are target areas where signals may form,either a reversal, consolidation or continuation. It is vitally important to wait for a signal, and then a confirmation, before making any trades based on this technique. Once I have identified a point of potential resistance I have two places from which I could draw my lines. Both are equally important so I always draw both. The first if from the highest closing price in the movement, the second is from the highest candlewick. I always use candlestick charts, just FYI. In my experience either line could provide resistance to price movement and it is the interaction of price and the lines together that matters more than any one candle, or any one line. This is a sort of convergence trading that uses multiple resistance lines and price action to form a signal. 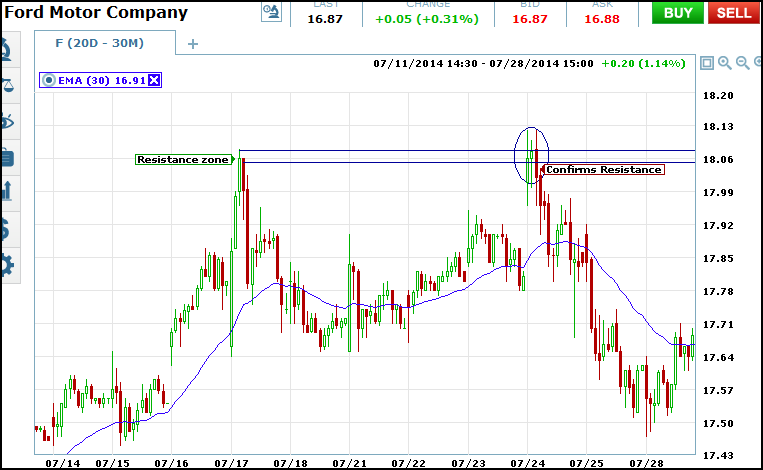 Look at the chart below, I have drawn two possible resistance lines from a peak formed in mid July. These lines are drawn from the highest close, and the highest upper wick, creating a tight band of resistance. Looking to the right hand of the chart you can see that once price met this resistance band it was halted. The thing to note is that it is the zone of resistance, and not just the line itself that is important. This is why waiting for a confirmation of resistance is required for a trade. The first two candles that test the zone show that resistance is there, but the reversal is not confirmed until the third candle. Now let’s look at another chart. 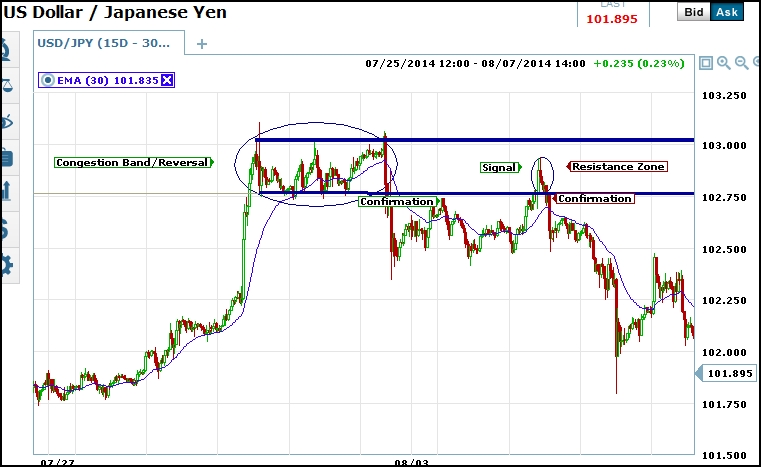 On this one, a 30 minute chart of USD/JPY exchange rates, there is a clear congestion area between 102.75 and 103. This band is also a triple top reversal pattern confirming upper resistance at 103. For us it is the zone we want to focus on as the upper boundary may not ever be reached. We can see that a few days after this reversal is confirmed prices drop sharply and then move higher to retest the resistance formed by the reversal/consolidation pattern. On the first test prices are repelled at the lower boundary but this is not always the case. On the second test prices break into the zone but reverse before they ever reach the 103 level. This does not mean they can’t or won’t, I just want to impress upon you that resistance may be more of a zone than a line drawn in the sand. A break above the lower limit is not necessarily a break of resistance. Sometimes it is a break into resistance, a break into a range in which sellers, short sellers and other forms of bearish traders will emerge. This is why it you must wait for a confirmation. With a band such as this one the confirmation would be a break out of the zone.